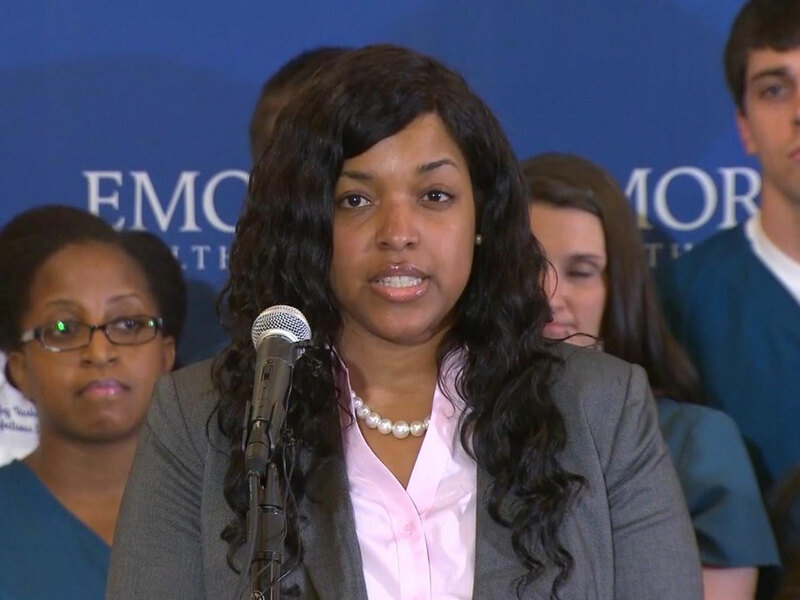 ATLANTA - Amber Vinson, a nurse who fueled Ebola fears by flying to Cleveland after being infected by her dying patient in Dallas, is now virus-free, and was celebrated Tuesday by her caregivers as courageous and passionate before getting out of the hospital. Dr. Bruce Ribner, an infectious disease expert who oversaw Vinson's recovery at Emory University Hospital, said fellow medical workers "deeply admire Ms. Vinson's care and courage in caring for patients with serious communicable diseases. Nurses are on the front line 24 hours a day in treating our patients." Ribner said doctors were "not sure" why Vinson and fellow Dallas nurse Nina Pham recovered so quickly from the virus, given its traditional high mortality rate. Some theories doctors have suggested include the young age of the two nurses, as well as the fact that they probably got a relatively low "viral load" when they were exposed due to their protective gear. Emory University Hospital spokeswoman Holly Korschun later confirmed that Vinson received blood plasma from Ebola survivor Kent Brantley, and said Ebola survivor Nancy Writebol also donated her plasma, but it wasn't ultimately needed. The successful treatment of four total patients now at Emory in Atlanta has provided many lessons for how to handle Ebola patients in the future, Ribner said. Ribner also said her doctors in Atlanta don't have any knowledge of how she got infected in Dallas. Vinson's trip home to join her bridesmaids for wedding preparations was one of several moves by doctors and nurses that may have exposed others in the United States. In Ohio alone, about 150 people were still being monitored because of contact or potential contact with Vinson in a bridal shop and on the airplanes she traveled in. N.J. Gov. Chris Christie said voluntary stay-at-home measures were obviously insufficient, since even doctors and nurses had moved around in public before getting sick. He was among the first to announce mandatory 21-day quarantines for anyone who had contact with possibly infected people. Vinson, 29, was infected while caring for Thomas Eric Duncan, who died at Texas Health Presbyterian Hospital Dallas on Oct. 8. She inserted catheters, drew blood, and dealt with Duncan's body fluids, all while wearing protective gear to prevent transmission. Ebola is only contagious when people who carry the virus get sick, and Vinson didn't show symptoms before flying to Ohio on Oct. 10. She reported her temperature to the Centers for Disease Control and Prevention, as required, on Oct. 13, and was cleared to fly back to Dallas. The next day, she developed a temperature, and on Oct. 15, she tested positive for Ebola. Nina Pham, who also was infected by Duncan, was released Oct. 24 from the National Institutes of Health in Maryland. Another nurse who was held for days against her will in a medical tent in New Jersey after volunteering in West Africa was in an "undisclosed location" in Maine on Tuesday, objecting to both states' Ebola quarantine rules as overly restrictive. While world leaders appeal for more doctors and nurses on the front lines of the Ebola epidemic, health care workers in the United States are finding themselves on the defensive. Lawyers now represent both Amber Vinson, who contracted the virus while caring for a Liberian visitor to Texas, and Kaci Hickox, who is challenging the mandatory quarantines some states have imposed on anyone who has come into contact with Ebola victims. Getting more volunteers to the front lines is the only way to keep the virus from infecting people around the world, experts say. It's still spreading faster than the response, killing nearly half of the more than 10,000 people it has infected in West Africa. World Bank President Jim Yong Kim said Tuesday that at least 5,000 more health workers are needed in Liberia, Sierra Leone and Guinea to fight the epidemic. Kim was in Ethiopia with U.N. Secretary-General Ban Ki-moon, who has spoken out against mandatory quarantines for health care workers, and said Ebola-related travel restrictions and border closings are not the answer. Hickox, the Doctors Without Borders volunteer, was staying in an "undisclosed location" Tuesday, said Steve Hyman, one of her lawyers. Maine health officials announced that she will be quarantined at home for 21 days after the last possible exposure to the disease, following the state's health protocols. But Hyman said he expected her to remain in seclusion for the "next day or so" while he discusses her situation with Maine health officials. Hyman said the state should follow the Centers for Disease Control and Prevention guidelines, which require only monitoring, not quarantine, for health care workers who show no symptoms after treating Ebola patients. "She's a very good person who did very good work and deserves to be honored, not detained, for it," he said.